Ground and air crews from the Marine Aircraft Group 11 at Miramar launched over 35 aircraft nearly simultaneously on Friday morning in a major readiness exercise. “I directed this event to exercise MAG-11’s real world capability,” said Col. Simon Doran, commanding officer of the group at the sprawling Marine Corps air station. Officials said the exercise, which was visible over Del Mar, Carmel Valley and University City, provided realistic training to ensure the entire unit is deployable on short notice. 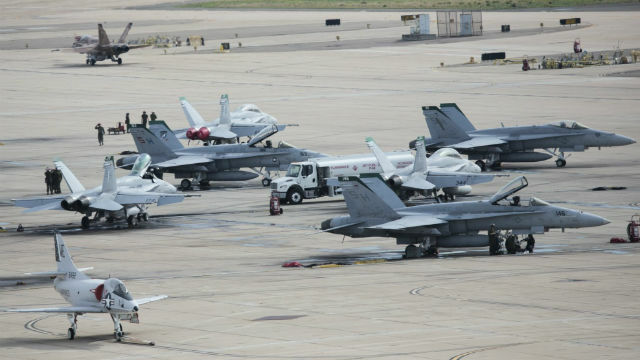 Within minutes, more than 30 F/A-18 Hornet fighters and 2 KC-130J Hercules refueling tankers started their engines and moved to the taxiway, forming a line known as an “elephant walk” that stretched nearly a mile. Upon receiving the command to launch, the pilots of the first four Hornets throttled their massive engines’ afterburners and within seconds were out of sight. They were immediately followed by the next four aircraft until all were airborne. Officials said the exercise demonstrated the unit’s ability to “fix, fly, and fight” on short notice.